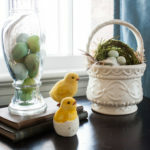 This is an exciting week for fellow lovers of fabric and home decor. 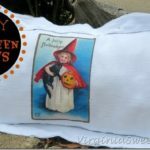 Over the next four days, nineteen blogging friends are sharing DIY decorator pillows made with gorgeous fabrics from OnlineFabricStore. 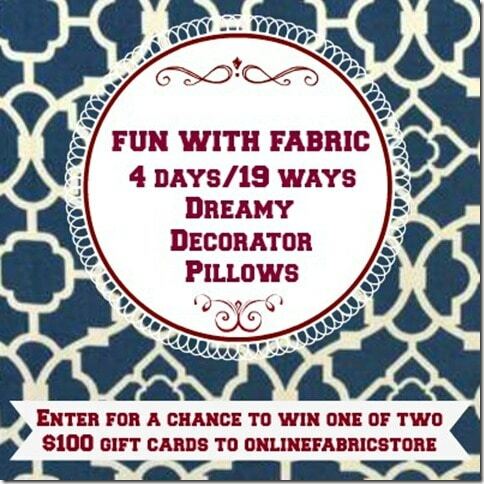 Not only will you have the opportunity get pillow and fabric ideas, you can enter to win one of two $100 gift cards to OnlineFabricStore! Pillows are one of the easiest ways to change the look of a sofa, chair or bed. 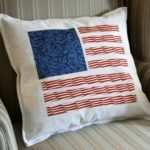 Making a DIY decorator pillow isn’t difficult and is something that anyone with basic sewing skills can accomplish. 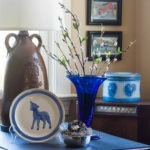 Once you master the technique, it’s a snap to change the look of a room for not a lot of money. Each participant in this challenge was invited to select one yard of fabric from OnlineFabricStore. 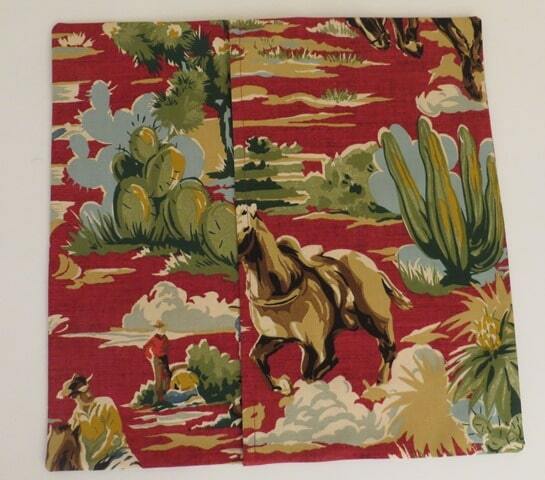 I love browsing through fabric selections and quickly decided that my DIY decorator pillow would be made using Braemore’s Ride Em Cowboy Chili fabric. 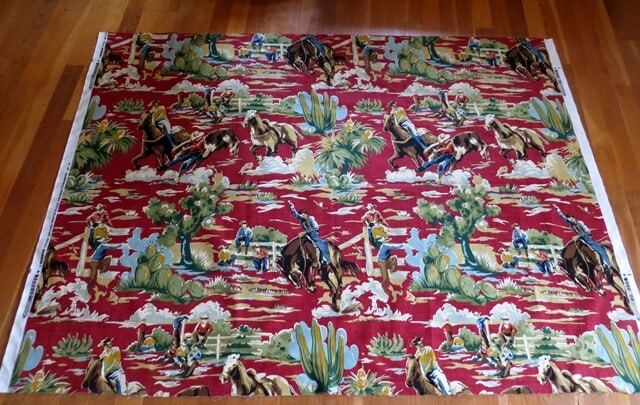 I loved the vintage look of this fabric, the color, and of course, the cowboys. Yee-Haw! 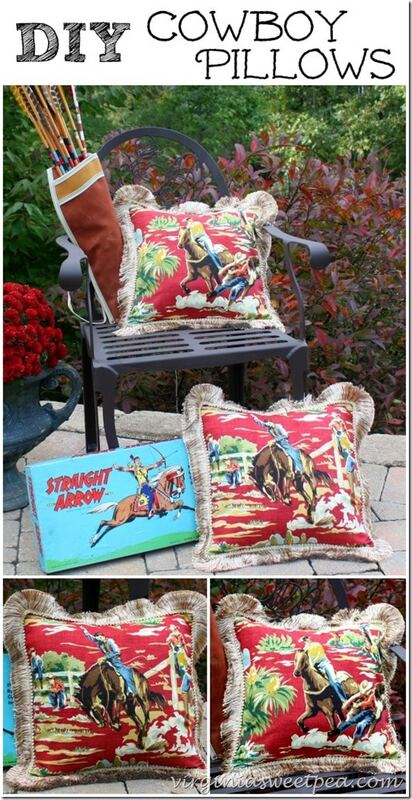 After a short time at the sewing machine, I had two DIY decorator pillows with a fun cowboy theme to use in my home. Do you like my vintage cowboy accessories? The quiver, arrows, and game were my dad’s and date to the late 40’s or early 50’s. Ride ‘em Cowboy! This guy isn’t about to get bucked off his horse. Did you know that I am a former equestrian? 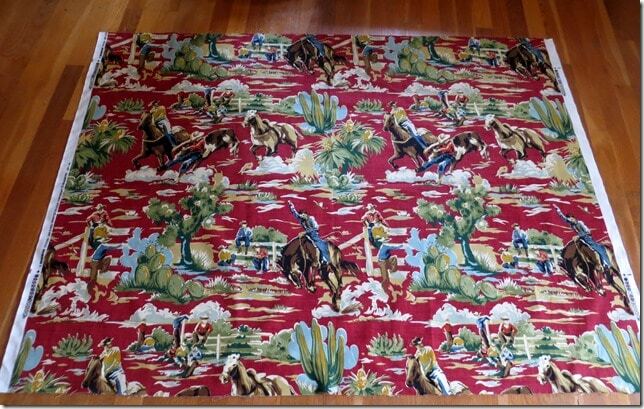 I don’t ride anymore but I’ve never lost my love for horses, thus the horses on this fabric immediately appealed to me. 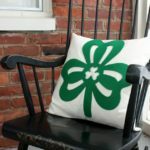 Now that you’ve seen the two pillows that I made with one yard of fabric, let me show you how I did it. 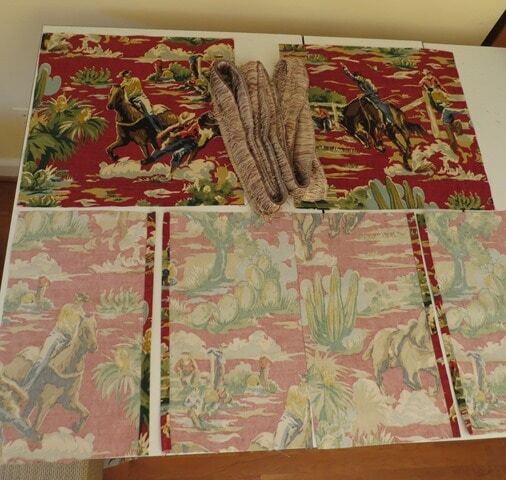 After my fabric arrived, I spread it out on my craft room floor to look for the repeat and to figure out what part of the fabric would be used for the two pillow fronts. 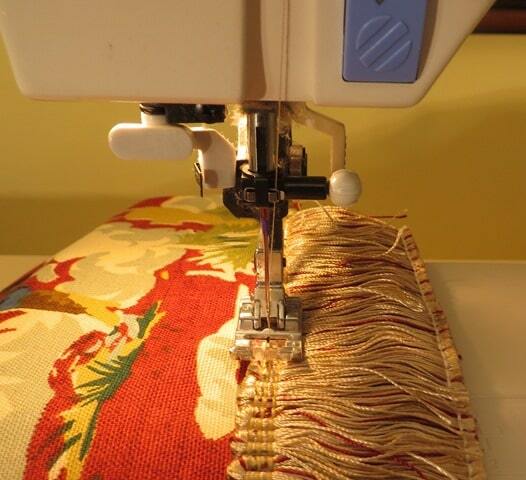 Since my pillow form was 16” x 16”, I cut each pillow front 17″ x 17” to allow for a 1/2” seam allowance on each side. Two back pieces for each pillow were cut at 17” x 11. 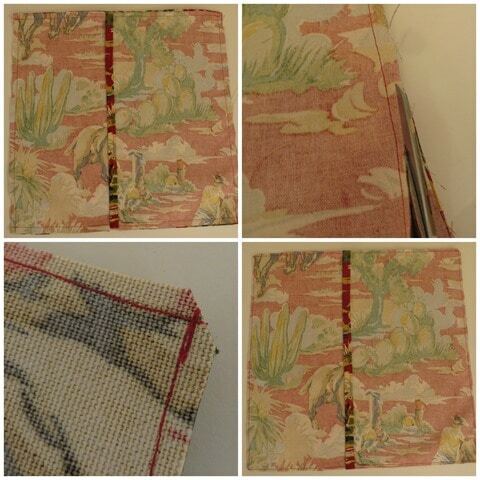 I like to make envelope style pillow covers because they are simple to sew and are easily removed. 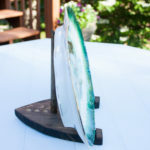 When sewing, your iron is just as important as your sewing machine. 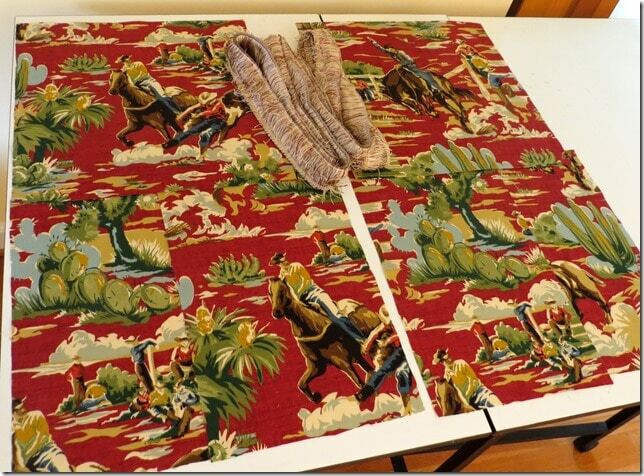 Fold each inside edge on the two back pieces in 1/2” and iron into place. Fold in again 1/2”, iron, and then sew. Now the back pieces are ready to be pinned to the front pieces. Right sides together, line up the edge of one back piece, then the other, and pin into place. 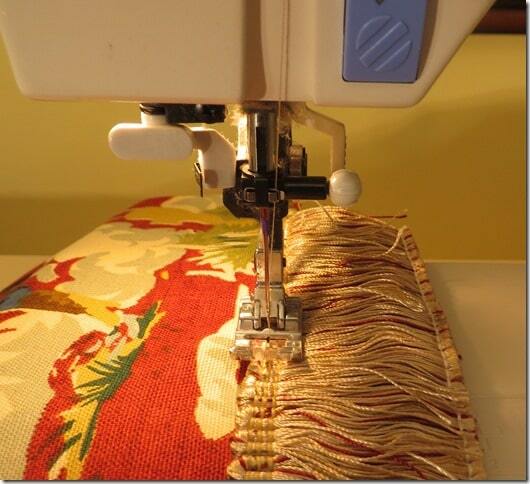 Sew around the perimeter of the pillow cover using a 1/2” seam allowance. 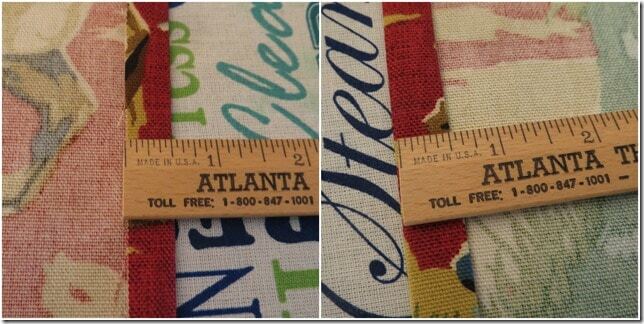 After sewing, trim the edges and clip the corners to remove bulk. Turn the pillow cover right side out and press. The pillow cover is ready to use at this point. I added trim, so I had one more step. My trim came from a local estate store. 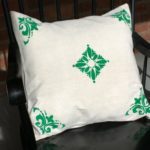 OnlineFabric offers this trim that would be a good match if you plan to make your own version of this pillow. 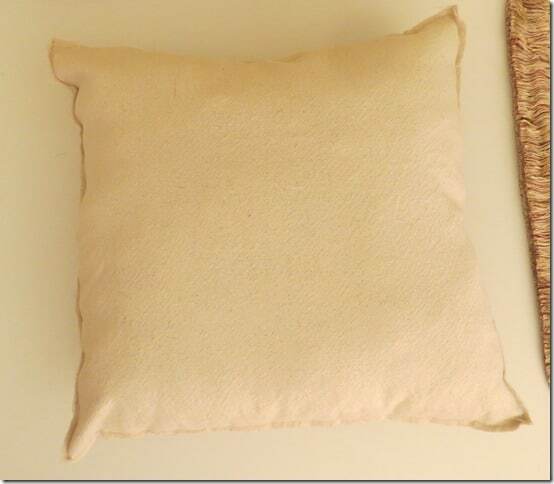 I sewed the trim to the edge of the pillow using a straight stitch. 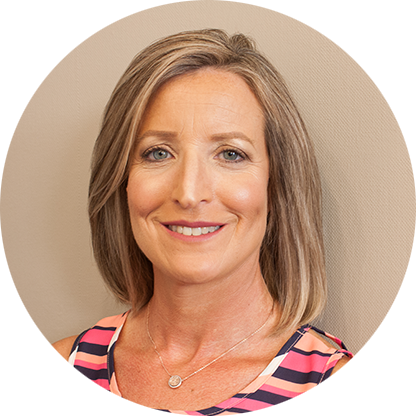 Trim like this will unravel easily. To prevent unraveling where I started and stopped applying the trim, I sewed over those areas a few times with a zig-zap stitch before I started the straight stitch. 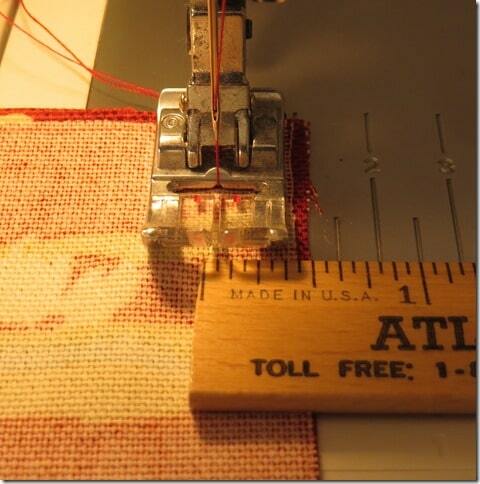 When I got to a corner, I clipped the temporary thread on the outer edge of the fringe. After the fringe was sewn into place, the temporary thread was removed and the fringe was fluffed. OnlineFabricStore graciously provided me with a pillow insert. I needed a second insert since I was able to make not one, but two pillows from my one yard of fabric. I made a quick and easy insert with two pieces of drop cloth (any cotton fabric would work – the drop cloth was ironed and on top of my fabric stash) for my second pillow. 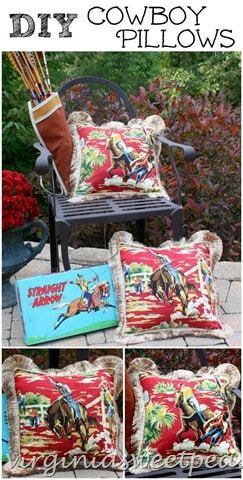 The inserts were added to the pillows and this project was done! 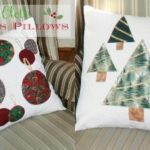 If you don’t sew but want pillows for your home, OnlineFabricStore now offers ready-made decorative pillows at a very reasonable price. 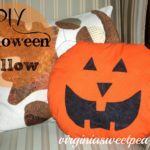 Be sure to visit my friends who are also sharing DIY decorator pillow ideas and tutorials this week. I can’t wait to see what fabric each selected and how they used their fabric to construct a pillow. 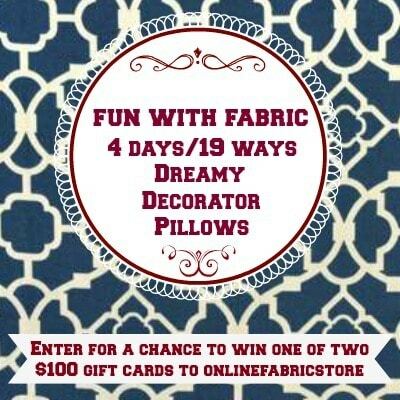 Now it’s your chance to win one of two $100 gift cards to OnlineFabricStore. Use the rafflecopter below to enter. Good luck! 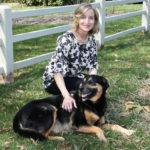 Many thanks to OnlineFabricStore for sponsoring this fun blogger event. 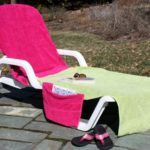 I loved both the fabric and pillow form that I received. OFS™ 16″ x 16″ Argonia Multi Floral Decorative Pillow is my favorite. Your pillows turned out fabulous! What fun fabric! 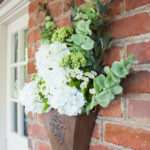 The trim you chose looks perfect with it as well…great job! Thank you so much for sharing your instructions here for the pillow covers, very detailed and easy to follow! Love the vintage type fabric you chose too!!! 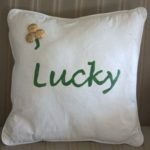 Love your pillow – and that vintage collection is awesome!! I hope you have pictures of your Dad dressed as a cowboy when he was a kid! Love your pillows! I had no idea you were an equestrian. A lady of many talents for sure. That’s a good looking pillow! 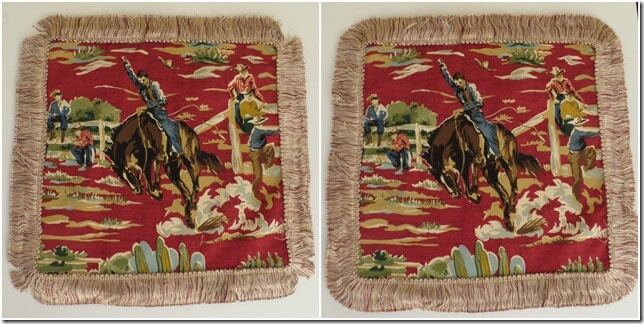 Love the cowboy on the horse, especially since it has sentimental meaning for you. Thank you for showing how to attach fringe in your tutorial! Love your pillows. I would choose the bird fabric. Thanks for the chance. You did a wonderful job! The pillows look professionally done! I love your pillows and that fringe is to die for! If I were to pick a favorite pillow it would be the Hillstone Brown Paisley…it’s gorgeous! 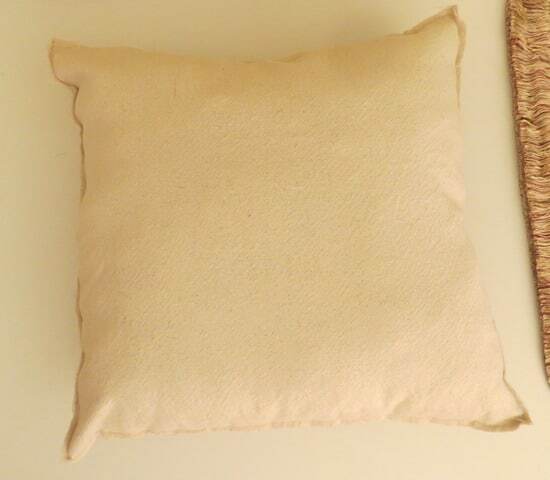 OFS™ 16″ x 16″ Morley Seafoam Solid Decorative Pillow is lovely! 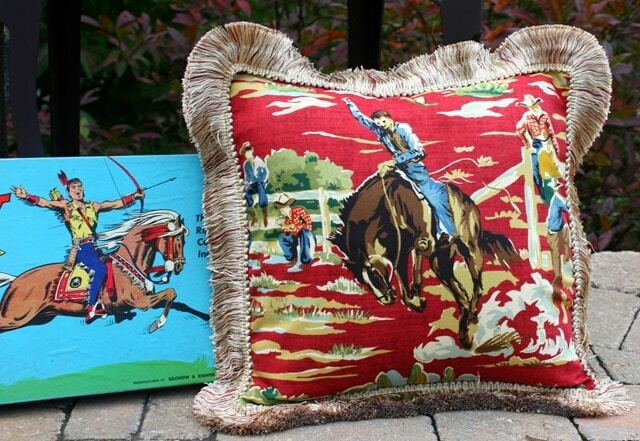 The pillow turned out great and I love the trim you picked out too. 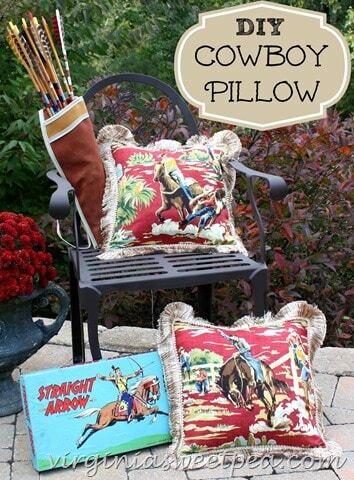 Your vintage cowboy pillow makes me smile. What fun! Thanks for the tutorial. I visited the Online Fabric Store, and I like the Artesia navy floral pillow! I like the Bellini Aqua Jacobson pillow. 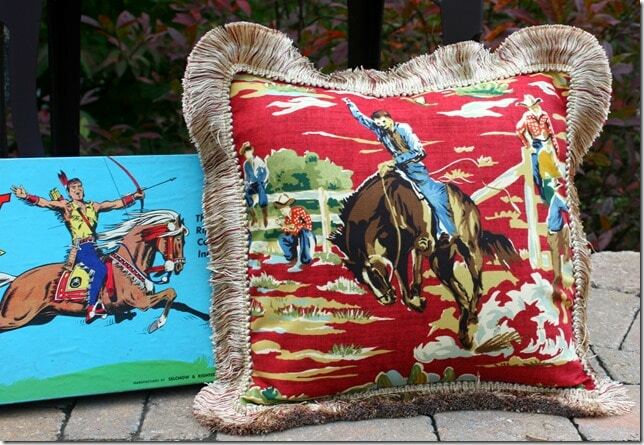 OFS™ 16″ x 16″ Ashwater Charcoal Embroidered Decorative Pillow is beautiful! Surry Tanned Diamond is my fave pillow. 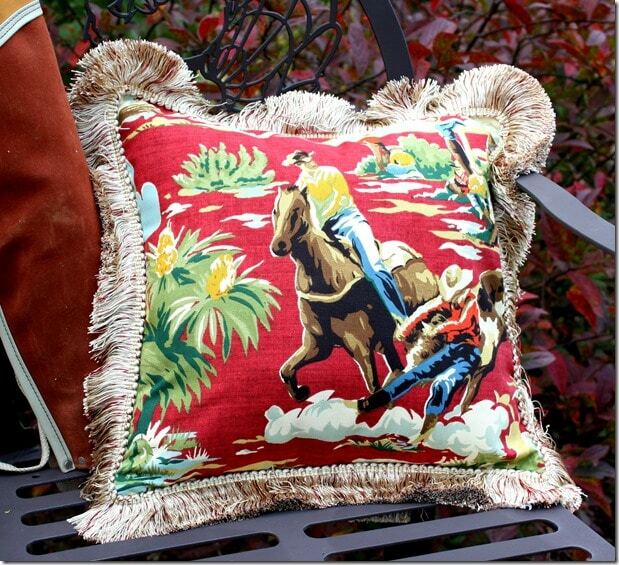 Such a fun pillow, Paula! You did a great job and I love the trim. Pinning! You’re pillow looks great Paula!!! I love the trim you chose for it. Have a great day friend! 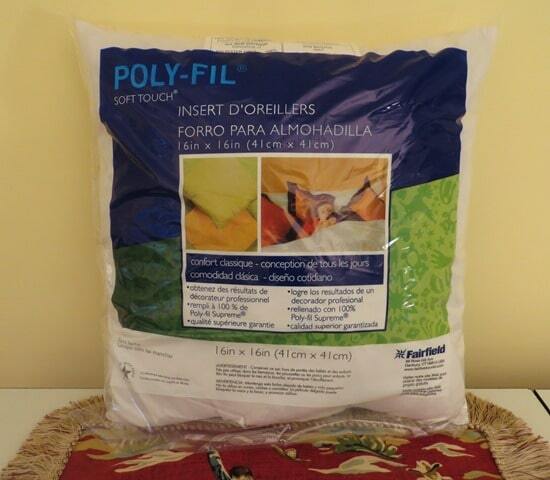 I love your pillows, Paula! 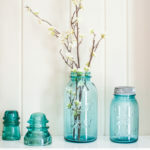 They remind me of vintage 1950’s decor (which I love!). I love how you always have the best themes and items to go along with them! This pillow is beautiful and looks so professional – as so all the great pillows. Such a fun idea!